The US and Japan need to align their policies on China strategy, deterrence and offensive military capabilities. The new defense plans emerging from Tokyo and Washington, D.C. offer a high degree of convergence. In Japan’s December 2013 National Defense Program Guidelines (NDPG) and the United States’ forthcoming 2014 Quadrennial Defense Review (QDR), both allies seek to address the short- and long-term challenge of a reemerging China, while placing military forces within a comprehensive framework. However, there remain at least three hard questions to be answered regarding future alliance cohesion: viz., how to forge a common China strategy, how to sustain extended deterrence, and how to integrate Japan’s increasingly independent capabilities, including offensive strike weapons. Absent candid and persistent reflection on these issues, what now appear to be acceptable gaps could develop over time into deep fissures. Japan’s latest NDPG is the fifth such document to be published in the postwar period. The 1976 National Defense Program Outline (as it was called then) emerged in the midst of U.S.-Soviet détente and burgeoning strategic arms control agreements. A second was released in 1995 to update and rejuvenate the alliance after the end of the Cold War. A third was written in 2004 in the aftermath of the threat of global terrorism and growing nuclear and missile threats. A fourth, issued at the end of 2010 by the previous Democratic Party of Japan government, emphasized the rapid shift in the global balance. The latest document, perfectly synchronized with the release of Japan’s first National Security Strategy and a five-year Mid-Term Defense Plan, emphasizes the deteriorating security environment in East Asia: North Korea is unstable and better armed; mitigating the effects of major disasters requires better preparedness and civil-military crisis management; and China’s coercive diplomacy and military modernization are causing alarm. Chief among Japan’s concerns is China’s growing maritime assertiveness. One aspect of the assertiveness is China’s resort to tailored coercion in “gray zone” areas of the East and South China Seas. Another aspect is China’s acquisition of anti-access and area-denial (A2/AD) capabilities (a concept alluded to for the first time in an NDPG). The near-term challenge is mostly a probing and nibbling strategy to test reactions to China’s unilateral alteration of the status quo; but in so doing, China has effectively stiff-armed repeated high-level Japanese requests to develop a crisis prevention and response mechanism between Japan’s Ministry of Defense and China’s Ministry of National Defense. The long-term challenge is China’s apparent intention to exercise sea control over its “near seas,” and sea denial out to at least the first island chain of countries ringing these bodies of water. The Department of Defense’s new QDR is still awaiting official release, but the gist of the review is already in the public domain. From what is known, there appear to be at least three areas of major convergence with the NDPG: the large security challenge of deterring and dissuading Chinese assertiveness in the short- and long-run; a commitment to maintaining maritime and air superiority; and the desire to embed the military instrument of power within a whole-of-government policy. Of course there are limits to convergence: recognizing a China challenge is not the same as developing a coherent strategy for dealing with it; maintaining maritime and air superiority in the East China Sea may be more difficult than the United States’ maintenance of maritime and air superiority globally; and America’s comprehensive policy of gradually rebalancing to Asia is different in kind from Japan’s comprehensive policy of gradual defense normalization. Like the NDPG, the 2014 QDR underscores the uncertain security environment, including the challenge posed by emerging power centers. Concern over a reemerging China is clearly shared on both sides of the Pacific. It may be possible to read the latest defense guidance as an interim blueprint for maintaining U.S. and U.S.-alliance primacy in the face of China’s hefty military modernization. Acting Deputy Secretary of Defense Christine Fox, in a revealing speech on February 11, noted that she and other leaders in the Pentagon are determined to preserve U.S. military superiority over near-peer competitors (read: China). Secretary of Defense Chuck Hagel, in previewing the QDR, emphasized that the United States will invest more to maintain superior air and naval forces. The QDR remains committed to 11 aircraft carriers while building 2 new destroyers and two new submarines a year, sustains the F-35 Joint Strike Fighter acquisition, and invests in new technologies such as unmanned systems and cyber warfare. Both the NDPG and QDR are part of a larger national vision and policy. Japan is in the process of effectively normalizing its security role. As early as April, Japan may act on a recommendation to adopt the right to collective self-defense, at least in some scenarios, and it is also looking to further relax its longstanding three principles regarding the non-export of military hardware. Although the United States will release its next National Security Strategy shortly after it rolls out the QDR, it remains committed to a policy of comprehensive rebalancing, including military assets and operations, to Asia. Critics might contend that the Obama administration is retrenching from global leadership and not following through with rebalancing. But such criticism ignores the need to make tough tradeoffs between retaining sufficient existing defense capability and investing enough to retain a cutting-edge defense force for the future. Clearly, the latest QDR will decrease some types of readiness (for instance, to fight another Iraq or Afghanistan war). By downsizing the Army by 13 percent and eliminating the aircraft optimized for close combat support (the A-10), the QDR is thus proposing to absorb more near-term risk in this particular scenario. Conversely, the administration is simultaneously hoping to better prepare for the “deep fight” or long-term competition in Asia. Just as Japan’s NDPG is embedded in a chiefly economic approach to international security (with “Abenomics” and structural reform the key hope for reviving the world’s number three economy), the United States hopes to take advantage of the enormous economic opportunity of a dynamic Asia (and hence the pursuit this year of a multilateral Trans-Pacific Partnership trade agreement). Having survived a dreadful year of sequestration in 2013, the 2014 QDR recommits the United States to shifting its most advanced and the majority of its naval platforms to Asia. But there are some important issues left more unresolved than answered by the NDPG and QDR. The three major potential divergences concern the strategy for grappling with the China challenge; the ability to retain credible extended deterrence; and the level of complementarity and integration of U.S. and Japanese armed forces. Crafting national strategy is difficult for any country, especially in today’s fragmented and fluid world. Alliance strategy is even harder, because of differences in security objectives, cultures, doctrines, experience, and geography. Japan is seeking to preserve the postwar system in East Asia while the United States is seeking to preserve it globally. Japan is worried about creeping encroachment in its waters and skies, while the United States has the luxury of observing general patterns of behavior from a distance. Distance creates different timelines. This explains why the NDPG is investing in the immediate creation of an amphibious capability, even though it means purchasing an amphibious vehicle (AAV7) not suited to the coral reefs surrounding most of the Senkaku Islands. The United States is trading in near-term readiness in order to free up more resources for the “deep fight,” or at least the long-term competition. Japan is not oblivious to the long-term challenge, but it has a sense of urgency because of the constant, near-term test being presented by China. While the general outline of a comprehensive counter-coercive diplomatic strategy may be emerging, the United States and Japan, as well as other states in the region, have no clear consensus on how to counter China’s tailored maritime coercion while trying to build an inclusive, rules-based regional architecture. Some believe China was surprised by Japan’s purchase of leases to some of the Senkaku islands in 2012, and it opted to ratchet up the pressure to contest Japan’s claim to administration and sovereignty over what China calls the Diaoyu Islands. This is why President Xi Jinping might be willing to shelve the dispute indefinitely, provided Japan would agree that administration of the islands is in dispute. But the islands have become a symbol of national governance in both China and Japan, and Prime Minister Shinzo Abe is not going to back down in the face of Chinese assertiveness. Paradoxically, President Xi may find that acceptable, because some level of tension with Japan strengthens him at home, by distracting a highly nationalistic domestic audience from local problems of corruption, quality of life issues, and slowing economic growth. The immediate question is whether the United States and Japan can forge a comprehensive and coherent counter-coercion strategy, not only for the East China Sea, but also for the South China Sea. But the overriding question is whether both the United States and Japan have a common vision for how to deal with the China challenge. Certainly Japanese are wary of any China-U.S. “new type of major power relations.” Some also find the U.S. rebalancing policy incompatible with China’s insistence that its “core national interests” are fully respected. These tensions are stoked by Chinese leaders who wish to place China on a par with the United States, and wish to isolate Japan and other neighbors who stand in its way. Because Japan is now a “front-line” state whose geography offers it no breathing space from China’s rise, officials in Tokyo may have less patience than those in Washington with respect to shaping a China that does not know how it will sustain fast economic growth or the legitimacy of the Communist Party. A second apparent alliance gap emerging from the NDPG and the QDR concerns how to preserve American extended deterrence in the face of rising Chinese military capabilities. Both Japan and Korea are dependent on the U.S. nuclear umbrella, and upon the notion that U.S. military superiority will provide protection because the U.S. armed forces can maintain escalation dominance all the way up to the nuclear level. But such military superiority is not providing an effective response to China’s largely non-militarized coercion in maritime Asia. China is also using its growing A2/AD capabilities and a nascent blue-water navy to signal to the region that it is only a matter of time before the United States loses its conventional military superiority. And China may be acquiring a secure second-strike nuclear capability that will further dilute the psychological assurance that America will be able to protect Japan in a future conflict. At a minimum, China’s tailored coercion, China’s growing A2/AD capabilities, and China’s growing mobile ICBM capability complicate U.S. extended deterrence. If Japan starts to acquire some offensive capabilities, as seems likely, as well as other elements of what might constitute its own A2/AD defenses, and if China responds with more military pressure, where will this leave the alliance with regard to extended deterrence? So far, these are future problems, but they are not so futuristic that the alliance should not be debating them today. A third potential divergence between Japan and the United States that can be gleaned from the NDPG and what we know of the QDR regards integration of forces. To what degree will Japan’s increasingly comprehensive and independently capable defenses—including potential offensive strike capabilities—be thoroughly integrated with those of the United States? The U.S.-Japan alliance has long tussled over the issue of “complementarity”—the idea that Japan should focus on acquiring forces that complement rather than compete with existing U.S. forces (JMSDF minesweepers to fill a U.S. Navy capability gap are a classic case in point). The good news in the alliance is that Washington is no longer vexed by Japan’s acquisition of more independent and comprehensive capabilities. Indeed, America’s relative decline makes some degree of greater burden sharing necessary. Thus, the question should not be choosing between complementarity and independent forces, but rather a question of integration of U.S.-Japan forces. 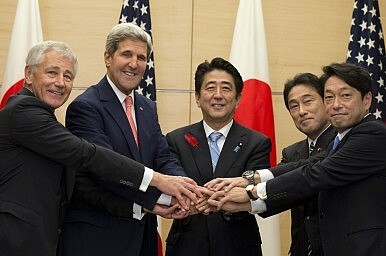 Given the U.S. and Japan defense guidance, Japan should undertake more responsibility for both its self-defense and as a “proactive contributor to peace.” This implies Japan taking greater responsibility for situations in areas surrounding Japan (Article 6 of the Treaty of Mutual Cooperation and Security between the United States and Japan). While the NDPG retains the U.S.-Japan alliance as a pillar of security, its innovation is to realize a new “dynamic joint defense force” that maintains local air and sea superiority and can rapidly defend and protect the Southwest Island chain. But the question is whether Japan, equipped with a more comprehensive military capability—to include the ability to strike back directly at North Korea or China should either commit aggression—will remain tightly integrated within an alliance strategy and military posture. This problem isn’t urgent, as Japan’s acquisition of such capabilities will be incremental and relatively modest. Nevertheless, its resolution is extremely important as it will form the consequential basis for many political, acquisition, and force structure and posture decisions. Conversely, with Japan now a frontline state, the U.S. will have to recalibrate its assumptions regarding the U.S. role in the defense of Japan per se, heretofore largely handed over to Japan. This will involve a greater than recognized resumption of American responsibility for Article 5 treaty operations in direct defense of Japan. These three challenges of strategy, extended deterrence and offense are not insurmountable. Moreover, it would be unrealistic to expect the NDPG and QDR to provide satisfactory answers to such long-term and complex problems. But ultimately, if these issues are not to decouple the alliance, they must be fully joined. In that process of frank and sustained alliance debate, it will be necessary to begin with the basics to ensure that officials in both capitals are pursuing common political objectives, especially because there is virtually no basis in the alliance for such conversations, let alone understandings. Nevertheless, despite the concerns about divergent pathways, the NDPG and QDR validate and document a strong alliance. Putting this guidance into practice will begin by hammering out new alliance defense guidelines to replace those laid down in 1997. That process is already five months underway, and the expectation is that it should be finished by the end of the year. That is not a great deal of time to grapple with such vital issues, and even then only time will tell how well the architects of that document have succeeded. Dr. Patrick M. Cronin is Senior Director of the Asia-Pacific Security Program at the Center for a New American Security (CNAS). A tale of two suitors: Chinese and Japanese investments in Central and Eastern Europe.